What? My Home Care Provider May Not Be Licensed? Many home care providers are employed by home health care agencies to provide companionship and non-medical-based services. Such individuals are required to have two to three years of experience in caregiving, but because such individuals are not allowed or encouraged to be actively involved in any medically based care (and that includes dispensing medication), it is often not necessary for a home health aide or companion to be licensed or certified by the state of residence. A very large number of home health care providers are former certified nursing assistants, or nurses’ aides, but again, because they are not allowed to engage in any specific hands-on medical care, they are not required by law to keep their licenses current. For example, let’s say Dad has a catheter and a Foley bank (the bag that catches the urine). A home health care aide is allowed to drain the bag into the toilet, but is not allowed to do anything with the catheter tubing itself. The same goes for wound care. A home health care aide may notice that bandages need to be changed, or pass on complaints of a care recipient to their supervisors, but they are not allowed to take off the bandage and replace it with another one. The same goes for medications. While medication oversight is encouraged of home health aides, they are not allowed to actually take medicine out of a bottle and give it to the client. 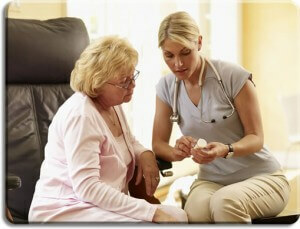 There are a large number of services that home health aides can provide that are non-medically based. A home health care aide does not need special licensing to help Mom get dressed, or to help Dad take a shower. They are allowed to encourage a care recipient to engage in active exercise, although they are not allowed to perform hands-on physical therapy type exercises. As you can see, there’s a big difference between non-medical and medical-based services provided by home health care agencies. Understanding the difference between the two will help you feel more comfortable and hopefully encourage Mom or Dad to feel that they and their needs are well taken care of, even if the home health aide is not registered, licensed or certified to provide hands-on medical care. Remember, for companionship services, light housekeeping, help with laundry, shopping, meal planning and oversight, transferring from one spot to another or to assist with walking, a home health care aide does not need to be licensed. Sure, some are; however, only those providing medically based care are required to hold certification by the state in which the care is provided.